There are a few stories out here on the backpacker trail, you kind of need to sort through them and decide which is real and which is legend. 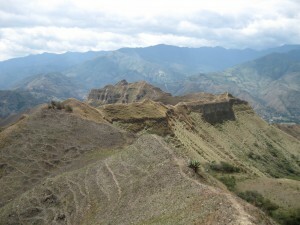 The one that intrigues me the most, is about a man working his way down from Colombia to Bolivia. He is known only by the name of “Micah” and despite just a few confirmed sightings, the myth is growing. He is believed to be a 6 ft tall American, with hair and eyes the color of dirt. His clothes are plain but efficient and his footwear is generally open toed. The ladies describe him as ruggedly handsome due to his perennially unshaven face and hair the has not felt the touch of a comb since the Reagan administration. I have yet to personally meet the man, always seemingly one step behind, hearing tales of his visit in each city I come to. Most stories tell of a stingy spender, always choosing the cheapest form of satisfying his needs. During one bus ride from Cuenca to Loja, he didn’t donate any money to the 3 youths who played music he greatly enjoyed. He is quoted as saying that it just didn’t feel right giving to 3 kids dressed in nice clothes, when he didn’t give to the disabled man asking for change just 5 minutes before. Then, in Loja, he stayed in a $4 a night hostal despite the fact that the smell in the shared bathroom made his eyes hurt. And, he began to indulge in the Southern Ecuadorian treat known as “salchipapas” (small hotdogs placed on top of a pile of french fries and covered with ketchup and a flavored mayo, normally served in a bag with a small plastic fork, and sold for 2 quarters). One bar story states: While walking to catch the local bus in Loja, he felt a man unzip the small pocket on his backpack, and single-handedly (his right hand) fought off the would-be thief while eating an empanada with his left. I don’t know whether to believe that or the other version that goes: On a city bus to the Loja terminal, some friendly passengers alerted Micah to a pocket being open on his pack, and kindly zipped it up for him. He immediately checked the contents when he got off the bus to find nothing missing. And, he will never know whether it was opened by a person looking to pilfer or left open during packing. Both stories sound feasible to me. He was then spotted an hour south, in Vilcabamba, strolling around the center plaza. Known as the “Valley of Longevity”, they say he drank the water there and will now live to be 123 years old. I also have heard from multiple sources that he hiked the “Mandango”, a rocky summit south of town. A French couple said they met a man at the locked entrance to the trail who crawled under barb wire fences and plowed through thorn bushes, helping them find the main path. He had a lollie pop in his mouth and for some reason asked them if they were English, despite the fact they clearly spoke to each other in their native tounge. Thus adding another layer of mystery to this man. Reports have him reaching the cross at the summit in record time before traversing the entire length of the ridge. One story says that he out ran 2 rabid dogs while cheating death hugging livestock trails over dizzying dropoffs. I think it is more likely that he heard dogs barking in a field down below, and decided to walk along the other side of the ridge and stay out of their sight. Then he descended via a rough ridge, scraping his arms and legs. One group of three hikers spotted a man sitting on a rock down below, snapping pictures of them silhouetted against the blue sky. I can only assume it was Micah. It is said he finished the day six feet under a cemetery, but after I attempted to retrace his steps, I think he probably climbed up a 6 ft dirt wall to get up to the cemetery and the main road back to town. The next day (Wednesday, August 11th), after his bus had a part changed in the middle of the road, he began heading south toward Peru. The trails grows a little cold from there, at the remote border crossing known as “La Balsa”, where they see less than a handful of gringos per day. But one lady told me that her best friend’s sister’s boyfriend’s brother’s girlfriend heard from this guy who knows this kid who’s going with a girl who saw Micah hop off the bus and wander out into Podocarpus National Park, to live out his last 91 years the way God intended. Or, if you want some more crazy rumors, he spent that night in San Ignacio, Peru at Hostal Dorado in room #402. The story of my time in Cuenca is one filled with cool temperatures, changed plans, little sleep, and turned off alarms. I didn’t do as much as I wanted, but I think I tackled the city fairly well. On Wednesday, 8 hrs on 3 different buses took me up over 8,000 feet. I was ignorantly not ready for the cool temps and effects of altitude. I walked around all day Thursday, checking out the churches, parks, and museums, wearing myself out. Then I attempted to go to sleep early, so I could wake up the next day and see Ecuador’s most important ruins (Ingapirca), about 2 hours north. No such luck, because this halfway done thing is really getting to me. When I embarked on my trip, I had set a few vague goals that have yet to be accomplished. So, my head has been churning the past couple nights, trying to plan the rest of the trip and post-trip. That kept me awake Thursday night, until the group of Ecuadorian yutes decided to play music and talk outside my window. They looked like the ruff and tumble type, that would stab me just to look at my watch and get the time, but the music they listened to said otherwise. I would compare it to the musical stylings of Richard Marx, which they gladly sang along to. I was kept awake until 4 am, and promptly shut off my alarm set for 7:45am. It turned out to be a good thing. Looking at pictures of the ruins online, they didn’t seem all that impressive and not worth the 4 hrs of bus travel. I opted for the Museo Pumapongo and it’s collection of shrunken heads, artwork, and large backyard filled with ruins, plants, and birds. It was free and entertaining. I later walked toward a hill for panaramic city views. 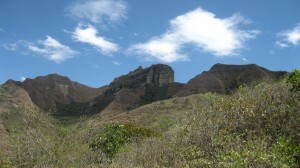 The 2nd day trip I had envisioned for myself, was to Parque Nacional Cajas, about 30 km west of town. The bus ride in to Cuenca came through the park and sparked my interest. The setting is a stunning Paramo, which is high altitude grass/shrub land, dotted with lakes and peaks. I set my alarm again, this time for 5:50 am, and again attempted an early bed time. But, good sleep was not to be had. Thoughts of possible travel destinations and future jobs, filled my head. After an hour or 2 of sleep, I awoke at about 3:30 am and decided to move that switch to the off position. Thus, Saturday was spent checking out the craft markets and posting pictures. I contemplated attempting a Cajas trip today, but I know there are more amazing hikes ahead of me down south. Though, the weather today was sunny and perfect, after 3 days of clouds. After all of those sleepless nights and that time spent inside my head, I feel I have figured a few things out. I will enter Peru in a couple days, crossing over at a remote location to see some hidden ruins. Then head to the coast and make my way down to Huaraz, with some of the best trekking in the world. I don’t know how much I can do without equipment, but it should be fun. After that, I shall cruise past Lima and check out the southern coastline before cutting over to Arequipa and some impossibly deep canyons. I also decided over the last few days, that I want to cut through the northern tip of Chile to enter Bolivia. Initially I had wanted to roll past Lake Titicaca, but that can be seen later. In Bolivia, I will live cheaply and explore everthing it has to offer, especially the desert region of Salar de Uyuni. From there, I will hopefully find a good deal on a flight from La Paz to Bogota, in order to catch my plane home. Roughly planning on 1 month in Peru, 1 week in Chile, and 2 months in Bolivia. So there it is, all laid out perfectly. This plan and the memory of my 100th empanada, a delicious bread pastry filled with spicy ground beef and topped with a creamy salsa, I take with me as the fruits of 4 long nights in Cuenca. Now, all I have to do is execute and take pictures. Next up: Todo lo que necesito es un plan para el resto de mi vida. I have reached the official halfway point of my trip. Sunday marked the 104th day since I left Portland and I have 103 more to go. It now feels short, the time has gone fast, I may need to act more with a sense of urgency, seize the day, grab the bull by the horns, paint the donkey, or just dance like I am not going to live this way forever. But, I will probably just lay on the beach some more. 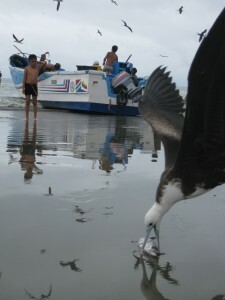 My second half began about 2 hours south of Manta, in Peurto Lopez, a small town full of fishermen and tour operaters. I was quickly greeted with offers for cheap hostals and sightseeing trips. Humoring one lady just to practice my Spanish, while turning down every hostal she showed me. I finally found an empty dorm room for $6 and was satisfied. The sole purpose of my visit was for a trip to the National Park island known as “Isla de la Plata” and the accompanying whale watching. I am lucky enough to be here during the migrating season, and couldn’t pass on the opportunity to see Humpbacks up close. If anyone is reading this with plans on venturing down here, the prices displayed as “official set tour price” are still negociable. I think all places will take $5 off thanks to the beauty of competition. 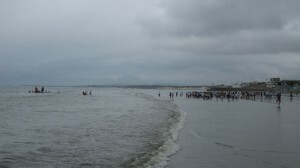 Sunday was the day, cloudy but not raining, I waited on the beach with the 14 other tourists for our boat. We ran late the whole day, with engine problems from the start. The Isla is about 40 km NW of the town and conveinantly, many whales migrate through this stretch of water. After about an hour, we spotted our first giant mammal. 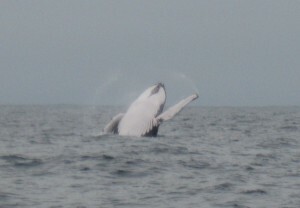 The boat slowed so we could join the other gawkers, and the whales jumped through the air, posing for photos. It is pretty amazing, they seem to be showing off, flapping their fins, splashing the water, doing twists in the air. The first shot I got turned out to be the best. After about 20 minutes, they went back down to the depths and we continued our journey to the Isla. A quick snorkeling stop along the shore had decent fish but it was cold. Then we hiked around the desert island, full of cactus and dry/dead plants. 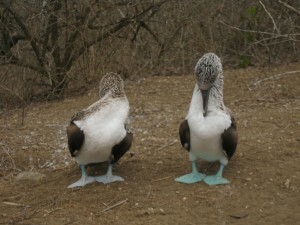 More importantly, it has “Boobies” of the red and blue footed variety. I loved the landscape and enjoyed the walk, despite the constraints of group travel. Due to our late start, the guide had to keep pushing the stragglers and French picture takers who snapped 20 shots of every twig. My camera continued to give me fits, refusing to retract and not allowing me to zoom, but I got the photos I wanted. 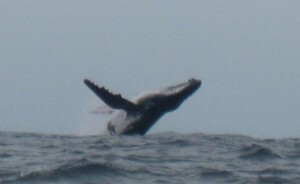 On the boat ride back, we got some closer views of the hefty aquatic acrobats and I set my camera on continuous. In hindsight, with my budget I probably would have been good with just a whale watching tour for half the price. Mostly because you would get more time to see them play, which is the highlight of the trip. Do they really do this when no one is looking? Monday: I rolled down an hour south, to a popular surf town that I knew I would probably despise. Between dirt road fishing villages, Montanita has roads paved with colored brick. The sidewalks are clean, the hostals are abundant, and the businesses all have clever names like Wipeout or Big Kahuna. But, it is not as bad as I intially thought. I feared that all food and internet would be expensive, I feared that the beach would be too crowded, and I feared that all the locals would annoyingly try to sell me stuff. But that is not really the case. On the same block as my $5 hostal, a lady serves up hearty $1.50 dinners and I can get a bowl of Encebollada (a fish stew) for 1.50, as well. The beach is gigantic, so I feel safe leaving my bag on the shore. And the people are all very laid back and not pushy. I can deal with a tourist heavy town, as long as I don’t have to eat the $5 meals in the theme restaurants. That being said, 2 days is enough, and I plan is to be in south central Ecuador by Wednesday night. I have not seen the sun in 4 days and rain seems to be a nightly occurrence. Plus, I appear to be allergic to something in the beach air. The past 5 times I have spent an hour or so on the sand, I have had minor breakouts of hives. This is nothing new to me, but the location and timing are odd. Next stop: Cuenca, Ecuador’s 3rd largest city and arguably it’s prettiest. I should be back among people I have more in common with. I feel a little too normal down here among the hippie surfers, or… am I the weird one? Un poco de algo para que usted pueda reflexionar sobre hasta la próxima vez. I have completed my desired amount of Spanish school. During the last week of class, I debated extending my stay, but it was really just a foolish dream. The weather in Manta was near perfect the whole week, with clear blue skies. More students were coming in and I was getting to know them better, thus was finding more things to do. Like playing bocce ball on an empty beach about 30 minutes south of town, where the brave ones kiteboard. I was also feeling good about my expenses, living for about $10 a day (not counting school) while still enjoying the local food. Plus, speaking Spanish was fun, fueling a desire to learn more. But the biggest reason may have been a mild crush on my teacher, a 24 year old Ecuadorian college student. Imagine the sweetest and most attractive South American girl you can, and now double her (I don’t mean in size, she is not a giant, just double the attributes). She laughed at many things I said and her clear speaking made me feel like I was a Spanish genius. During one mistake in class, I did not pronounce an “A” correctly and accidentally said “Yo satisfago mi hombre” instead of “hambre“. Which means “I satisfy my man” instead of “hunger”. The stunned look on my teachers face was memorable. I am not really sure why I need to know how to conjugate the verb for “satisfy”, but it resulted in uninhibited laughter. The next day for an example sentence, she said “Tu parece gay porque de las cosas que dices“. Despite the sunny weather, the beach conditions were not ideal. 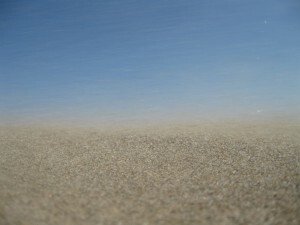 High winds resulted in blowing sand that would not allow any peaceful reclining. Plus, my desire to take pictures of the blowing sand, resulted in a camera that is now not firing on all cylinders due to sand penetration. I had to post this pic, so that my camera's pain would not be for nothing. The most logical reason that I left, is that I couldn’t afford it. I am constantly doing the math in my head and I don’t want my bank account to be zero when I get back. I will need something to survive on until those Powerball numbers hit. Plus, I think I have been wasting a little too much time and I now feel the clock is ticking. My Spanish, well that did not hold up on Friday. I had not been studying enough and couldn’t remember any verb defintions. It was frustrating but there were other factors. Trying to choose verbs for sentences when I have paired them up with an English word in my mind, is tough. They don’t always fit and I need to learn to detach it and keep it a languge all it’s own. Or something like that, maybe I was too busy staring at my teacher. As far as my crush goes, that was just a childish dream. The language barrier is a little to deep and I am a little too poor. There were often moments during our sessions when she would say something that was obviously a joke, but I would not understand and just try to laugh anyways. Then, there would be the awkward silence and we would just get back to work. Oh well, hopefully she accepts my request to be friends on Facebook so that my Mom can start stalking her. As you see, the negatives were a little too strong and it was time to go. My last Friday night in Manta: I succesfully got pictures of a sunset and then checked out the casino. I had a fun run on the video poker machine, hitting a “straight flush” and a couple “four of a kind”s, but gave it back and more at the Blackjack table (ended -$12). I then tried to meet up with the other students at a bar that may not exist (they couldn’t find it either). So, I made the 30 min trek back across town in the dark, slightly enjoying the uneasy feeling of dimmly lit city streets. I had a decent weekend. Plans changed, but for the better. Everything seems to be coming up Micah. The island tour trip thing got cancelled due to a lack of people. So I spent 2 days on the beach, sculpting sand humans and catching my first sunset. 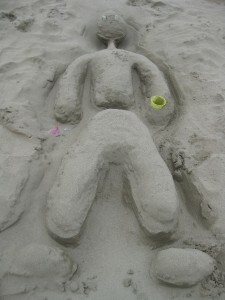 My sand creations drew some attention, with passing locals stopping to make additions. One little girl either asked if it was a young boy or said that I was acting like a child. I couldn’t really understand. Sunday, I was supposed to move in with one of the professors, but upon my arrival, he informed me that plans had changed. He had an unexpected guest coming this week and recommended a hostal. I opted for my former home on the other side of the tracks and they welcomed me back with open arms. I didn’t really want to live with the guy anyways and was just being polite, so I was feliz with the turn of events. I have a new Spanish teacher this week, another young attractive female to try and make laugh. She speaks a little bit of English, which has helped. The next step in my training is verb definitions and conjugation. I am developing the knowledge base for proper sentence forming, I so greatly desire. English was always my worst subject, so I have to remind myself about pronouns, possessive pronouns, “to be” verbs, adverbs, and adjectives. Those are only for permanent characteristics like “El Papa es Catolico” and “Yo soy pobre“. That is all I will bore you with now, maybe more next time. Today, I had more fun learning verbs, this time the irregular ones. We are now actually able to have simple conversations about family and food. I even attempted to explain to her the difference between Catholics and Lutherans, in Español. I think I got a few of the key points out, empahasizing that we are the ones going to Heaven. After class, the clouds parted for the clearest sky I have seen in 2 weeks. 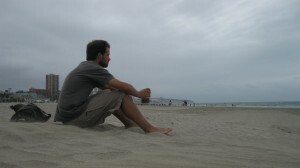 A new guy in school and I hit the sand and enjoyed possibly the best beach conditions I have seen in South America. Almost makes me want to stay for another week of class. The new guy also happens to have Portland roots: He grew up in Florence (OR), went to Gonzaga, and then taught theology at Jesuit High School for a couple years. He is just the 2nd person I have met with Portland ties. In Quilotoa, I crossed paths with a girl wearing a “Kell’s” shirt who had lived in PDX for a short period of time. Now, I must leave this free internet and begin the walk back to the bad side of town, where I belong. Tres días de clases restantes, luego regresé a la pista gringo. It has all been bueno. With 4 days down, I feel like I am learning a lot and eating a lot. I even caught a glimpse of the sun the other day. School: It is small, with only about 10 students throughout the day. We have cubicle like spaces where we sit across a table from or tutor. The 1-on-1 sessions have not been as boring as I thought. The teacher guides me through a lesson book, while I copy down what she points to. If I get stuck, she encourages me by saying that 7 year olds learn this stuff quicker than I do. My mind often wanders during the 4th hour, but I power through. Wednesday night, I did homework for the first time in 9 years. It is fun to write grammatically correct sentences and be able to attempt humor. Some vocabulary still requires a dictionary despite my teachers drawings and charade like motions. I believe, or at least hope, that some of it has found space in my brain to be recalled. Eating: I am on somewhat of a dairy binge, with a large pot of chorizo potato chowder, a grande batch of spaghetti with a tomato cream cheese sauce, and cereal every morning. I also feel the need to consume everything I purchased, so now it is a race against the clock to finish a dozen eggs in 36 hours. (I am considering “Cool Hand Luke” style.) Throw in a lack of exercise, and I should gain at least 5 pounds by the end of the week. Other Stuff: I hit the beach one afternoon when I saw a break in the clouds. 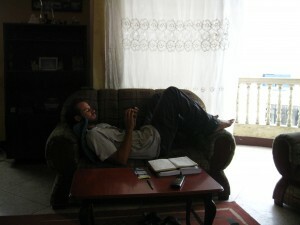 But mostly I just relax on the couch, read guide books, study Spanish, and watch movies. Yep, despite the noise from nightly fiestas and fireworks, apartment life is treating me well. The school also offers tours (not free) to nearby spots. I signed up for a trip to a nearby island that includes whale watching. Should be fun, but expensive. One way I allow myself these kinds of expenditures, I call “Bill and Ted’s Excellent Method” or Bat’em. During one of the brilliantly written scenes in the movie, B & T are in a bit of a pickle and need a diversion. They agree, in their own unique dialogue, to sometime in the future use their time machine to go back before that moment, and setup a tape recorder. Then, by the magic of time travel, their distraction is in place and (spoiler alert) they free the historic prisoners and pass the class. Now, the way the Bat’em method works for me is this: I tell myself, if I spend just $15 a day for the rest of the trip, I have extra cash now. And then, by the magic of ignorance, I have enough money to go on tours. I arrived in Manta on Thursday, getting my feet in salt water for the first time in over 2 months. The familiar Pacific Ocean littered with fishing vessels was just 4 blocks from my dirt cheap hostal. Few people actually swim at Tarqui beach, on the working class side of town. 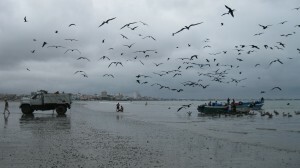 It’s mostly used for the fish market, traditional boat building, and driving on the sand to cheap seafood restaurants. Better than my proximity to the beach, was living near the epicenter of the town’s market action. Early every morning, I could just look out my window and see the usual stands setting up and buses rolling by. All very real and non-touristy. During my 4 days staying in that section of town, I saw 1 gringo. Bonus: That first night, I sampled empanadas from 3 different carts. Each one was 30 cents a piece, cooked in a pot filled with oil, and served with a garlic mayo condiment. 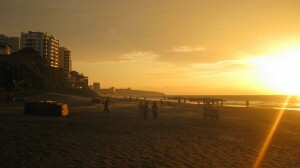 Friday: I walked 30 minutes across town, to the main beach “Playa Murciélago”. Very wide, flat, and crowded in the center. Low tide in the early afternoon results in a near 40 meter gap from water to soft sand. So, I sat on the wet matted down stuff, hoping for sun breaks and occasionally frolicking in the waves. Saturday: I finally got to the purpose of my visit to Manta, checking out the Spanish school. The original plan was to do that Friday, but did not previously obtain the address. So, with coordinates in hand, I walked in search of “Academia Surpacifico”. Up the hill, in a nice neighborhood, and at the intersection of 2 busy streets, it is close to things. I rang the bell of the office building and was greeted by a man crashing in the 4 bedroom student apartment on the 4th floor. The school is on the 3rd floor making for an easy commute, plus there is Wifi, ocean views (12 blocks away), and access to the rooftop patio. The fully furnished apartment with kitchen was one of my main selling points, and it was better than expected. With no staff around due to it being the weekend, I just gathered info and planned to call Monday morning. Then walked downhill to the beach to waste the day away. With a grande cerveza in hand, I sat on a small dune, keeping a safe distance from the surrounding lip-locked couples. Sunday: I strolled down to the fishing beach. Normally an early morning show, I was lucky to see a small boat unloading it’s catch, one crate at a time. That alone is interesting, but add in about 100 hungry osprey and sea gulls, and you got yourself an amazing sight. The men shuttling between the boat and dump truck have sticks but never use them. They seem to acknowledge the symbiotic relationship they have with the sea birds or are just tired from years of trying to fight back. The fish are mostly small, but often a bird grabs a large one and is unable to hold on while being chased by friends. These fish fall to the sand, are picked up, and then dropped again multiple times. Before one of them shows he has the chops to swallow the meal. I, along with a few Ecuadorian families, was highly entertained and took numerous photos. Breaking my attention from the fish mongers, was a religeous service taking place a little farther down the sand. They began to march my direction, before turning toward the water and getting wet. Not all worshipers joined, it was mostly just a crew carrying elaboratly dressed manequins on wooden platforms. 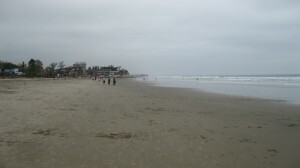 They ventured out to waist height, then walked back the other way, parralleling the beach. All the while, the sand standers walked with them and sang “Alabare”. There was also splashing involved, but I’m uncertain if it was meant to douse the manequins or the holders. Monday: Made a phone call and arranged to start class on Tuesday. Settled in to my new lodgings and went grocery shopping. Buying for only a few days was difficult but still fun. (I can only sleep here for 6 nights because it is fully booked for next week.) I made a chorizo and potato chowder that should last me a few days. If I get bored over the next couple days, I may do a food post with recipe. Other food purchases: I plan to make a spaghetti with chorizo later and daily cereal with bananas (no chorizo). I can’t satisfy all of my cooking desires in the short time frame, but this menu should help me pack on a few pounds. About school: Plan is to do 4 hrs a day of 1-on-1 for 2 weeks. 6 days in apartment, then either hotel or homestay. Currently have one roomate, a female from Philly, who is studying medical Spanish. Tuesday: Class from 8:30 am to 12:30, with break and free milkshake. Teacher is a female who doesn’t speak English and is with child. Very kind and patient but tough to fully understand all vocabulary by way of drawn definitions. I began learning masculine and femanine forms of stuff and proper use of “el”, “la”, “los”, and “las”. Also did plural forms. I am hoping I can get her to devote a day to casino lingo. Right now: The weather is comfortable, but not ideal for swimming. I am content with lying on the couch, listening to Beethoven, and punching keys on my Ipod. It’s as close to home as I will get for a while, free from the everyday stress of traveling. Hopefully, I come out of this break with a reenergized body and a bilingual tongue. Y yo pensaba que estaba demasiado fresco para la escuela. 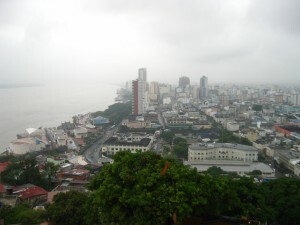 Coming to you live from Guayaquil: This is not the prettiest of big cities, but it satisfies a few of my current needs. The street market is loaded with cheap electronics and the food market is loaded with cheap fish. It feels good to be back near sea level and to wear shorts again. Plus, empanadas are so abundant, they can be used as a form of currency. Getting here was a long 7 hours of bus trips through rain and fog. It was fun to watch the scenery change to tropical, with flat land and large banana plantations. At one point, the driver blasted an unedited version of Eminem’s song “Without Me” for all ears to hear. I like to think that since it is in a foreign language, to them it sounds beautiful, like opera to us. Maybe some Ecuadorians think he is holding back tears while talking about love and women, and how his heart feels everytime his wife touches his hand. Or, is all of the opera I have listened actually vulgar and obscene. I vote for us all just listening in ignorant bliss. Being Ecuadors largest city, the bus station here is enormous. In an attempt to get a cheap ride to the city center, I observed the 100+ route city bus system for about 30 minutes, but was unable to crack the code. With the sun setting, I opted for a $4 cab ride to a known hotel but walked to a cheaper hostal a block away. The main drawback of this city is the cost of accommodations. My first night was $10 for a decent room. Walking the streets later, I saw a sign adverstising $6 rooms and decided to make the switch the next morning. Upon my arrival, they informed me that the cheapest room was $11 and that the sign was incorrect. So, I wandered the downtown streets some more and settled for another $10 place. It is not as nice as the first, but they might be doing my laundry for free. I was directed up, past the unfinished 3rd and 4th floors currently used to contain dogs, to a sink with a scrub brush. With the going rate only about $3 a load, I figured I would just take it to a shop, but the owner said that she found someone who would do it for me, and I handed my bag to a young lady. Monday: After all of the the hostal switching fun, I hit the market for a delightful lunch. First, a bowl of some fish soup that was nice and thick. Then, a plate of rice with shrimp ceviche and a cup of juice. All fresh, tasty, and only $1.50. Satisfied, I strolled the Bahia Street Market to hunt for bargains. Purchased some rechargeable batteries and got numerous wide ranging quotes for an 8gb USB storage device. I had one guy down to $21, but he was unable to locate the desired product in his storeroom. So, I went through again today, ready to haggle, and I think came away better off. I picked up a 16GB Kingston for $24, and so far it appears to work. Hopefully, I am now done with all necessary electronics purchases. The cleanest part of the city is their “Malecon 2000”, a long riverfront promenade. There are many shops and restaurants, but mostly just a nice boardwalk passing by a small zoo and a natural history museum. I followed it the whole length and climbed the stairs through the historic neighborhoods on the hill. At the top, a tourist lighthouse with good views of the city and river. Even strolling the dirty areas of the city, I kind of like this place. I like it when local action is going on all around me and for the most part, I am left alone. 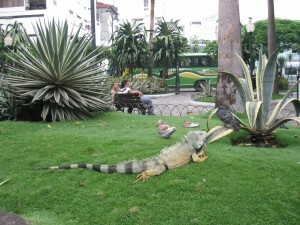 I like that they have a city park filled with free roaming large Iguanas and a turtle pond. I think it is cool that for protection in the park, they just have 2 rangers armed with what look like tranquilizer shotguns. I enjoyed hanging out at the local empanada stands along their main commerce thoroughfare. A group of university students chatted me up in English, the best they could, with one girl calling the stand owner mom, while the owner called the girl crazy. Today: Another market lunch, watched the Iguanas explore the park space some more, and made my daring though possibly stupid purchase. Tonight: More empanadas and, now that I got my long pants back from the laundry, possibly some casino fun. Tomorrow: Heading farther west, I hear life is peaceful there in the open air. Though I feel like I haven’t been doing all that much over the past week, I think the beach will be good for me. No commitment yet on the Spanish school, I want to check out the city first and didn’t feel right about making a down payment online. Also, just found out that one of my favorite bands, “James”, will be doing their once a decade stop in Portland this October. That will be tough to miss. Animo a todos a ir a verlos.